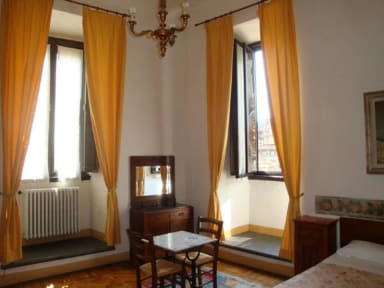 Hotel san giovanni is a characteristic old worldly florentine pensione. 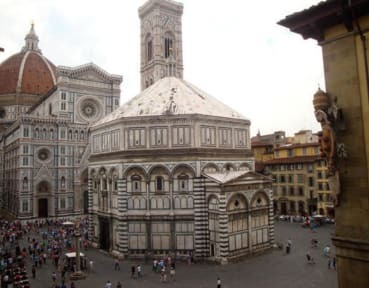 It is located in the heart of florence's historical centre, more precisely on via cerretani 2, right on the corner of Piazza San Giovanni (the Cathedral square). This superb location means all of florences museums, galleries and other tourist attractions are within a short walking distance from the hotel. The hotel is located in two medieval tower buildings that in the 16th century became the bishops private residence. Today it is still possible to see in some of the rooms the original frescos. You will enjoy the amazing view from your window of one the world's most beautiful piazza. Close to the Hotel, we have a nice Annex in San Lorenzo Square with 4 bright room with private bathroom. PLEASE NOTE: contact the property about pets. The room with ensuite bathroom have air conditioning. The Superior room have one external private bathroom. It is necessary to communicate the arrival time in advance. Our staff is available for your check only by appointment. Reception is open from 8:00 until 1:00 and from 3:30 until 7:00 pm. If you expect to arrive outside reception opening hours, please contact us to receive the codes for automatic self check-in. Check in from 12.00 am - Check out 10.30 am. A bit loud due to the location. Just olug in your earplugs and you will sleep fine! fantastic.Had breathtaking view of Duomo from our window. The hotel is very central with big rooms and its great value for money. It is a little hard to find and a larger sign outside would make finding it easier. I would stay again if i was going to Florence. Lovely old hotel, facilities are limited, shared bathrooms and no breakfast, but this adds rather than detracts from this beautiful and historic Hotel. I loved it, but not for others. Really, really welcoming staff. The annexx where we stayed was really nice, good views, good air conditioning, WiFi was of a good standard and both me and my girlfriend felt it was an overall nice stay. The bathroom was a tad on the small side, but it did the job. There were ALOT of stairs but we were fine with them and an elevator is available. Really close to the duomo and a good location. Only downside is we noticed a small colony of ants in our bathroom but it wasn't that big a deal.